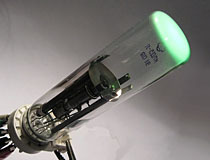 The ILD3 series is a family of Soviet flood beam cathode ray tubes intended for the construction of 'Jumbotron' style large video displays. Each CRT is designed to represent only a single pixel, and lacks the deflection and focusing components necessary to form a controllable beam. 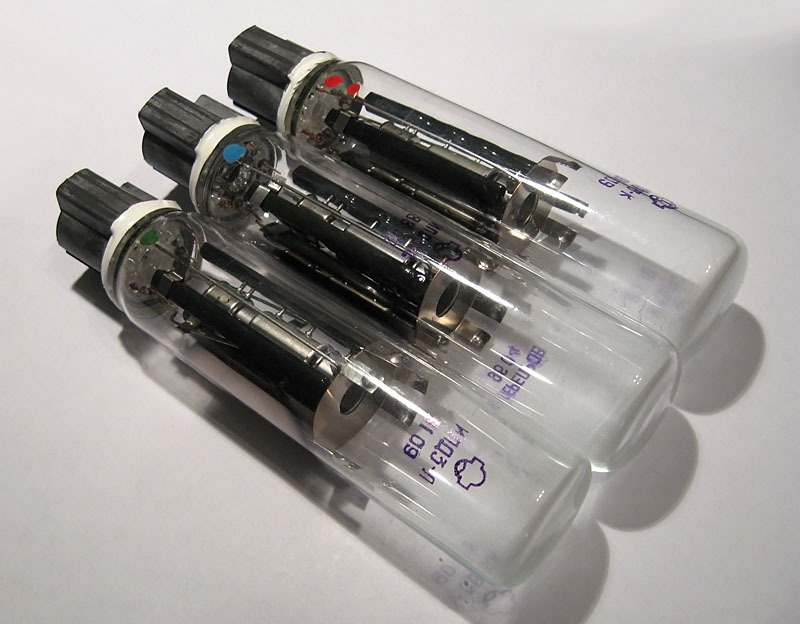 A single modulator electrode allows the diameter of the electron stream to be controlled, but in normal operation cathode rays are vomited out in a conical spray that covers the entire front of the tube. Each color is assigned a separate part number, with the ILD3-S producing a blue output, the ILD3-K producing red, and the ILD3-L having green phosphor. 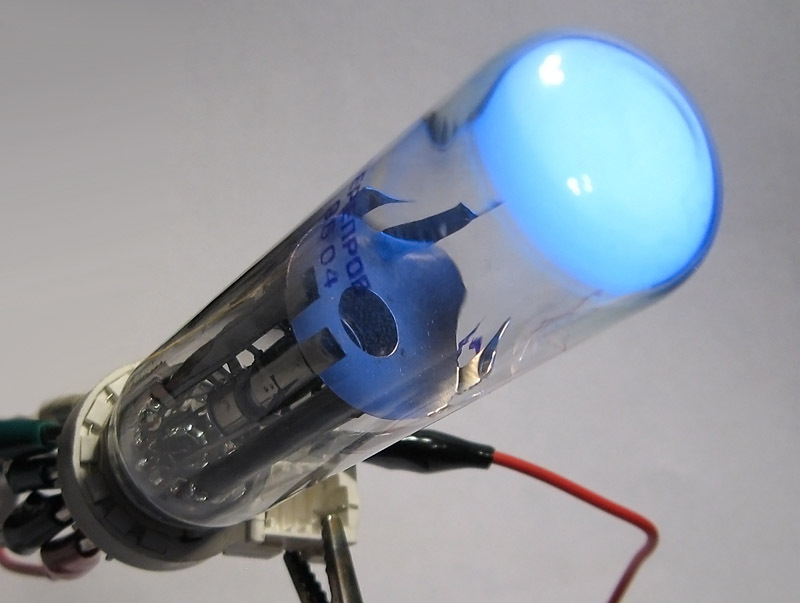 At first glance it seems like astounding overkill to design and manufacture a cathode ray tube that has been 'crippled' down into a glorified light bulb, but such a device does have distinct advantages. A flood beam CRT such as the ILD3-K can be turned on and off at a high speed with a relatively low voltage, a near necessity when displaying full motion video. Additionally, a traditional incandescent light bulb produces a copious amount of heat, and consumes substantial current to produce that heat. 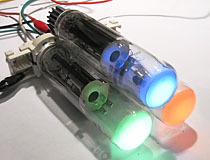 A typical Jumbotron-style display would need many thousands such bulbs to display a usable image, and could quickly become too hot to handle. Given the alternatives, flood beam CRTs were literally a decision of cold hard logic. 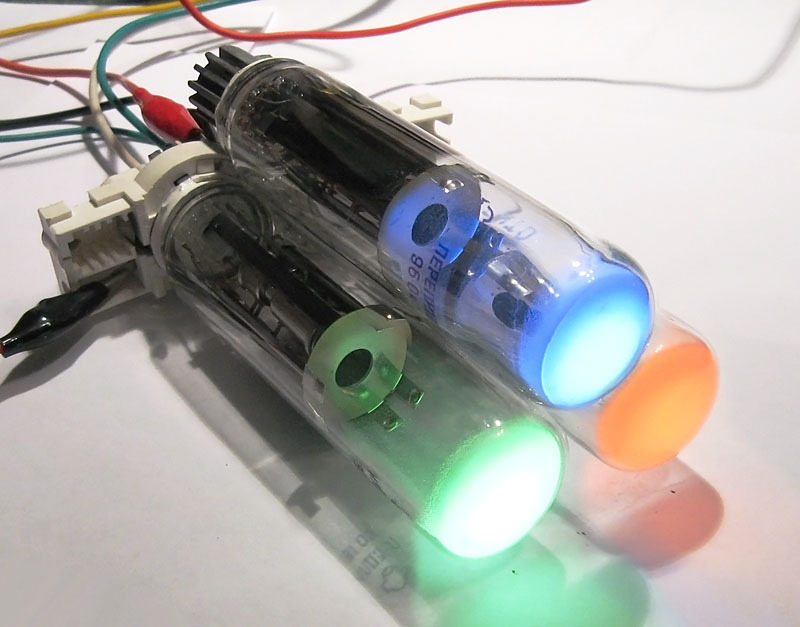 It should be noted that even though the thumbnail image shows these displays arranged in a 3 tube RGB configuration, originally the tubes would have been mounted in a four tube RGGB cluster. Human eyes are most sensitive to green light, and doubling the number of green elements in each pixel was a trick used by both Russian and Japanese manufacturers to improve the brightness of their early large scale 'Jumbotron' displays. The ILD3 family of tubes provide a full RGB solution for large scale bitmapped displays. Shown clockwise from top; ILD3-S, ILD3-K, ILD3-L.
ILD3-K flood beam CRT. The appearance of these displays in operation can be quite spectacular. ILD3-L green flood beam CRT, normal operation. 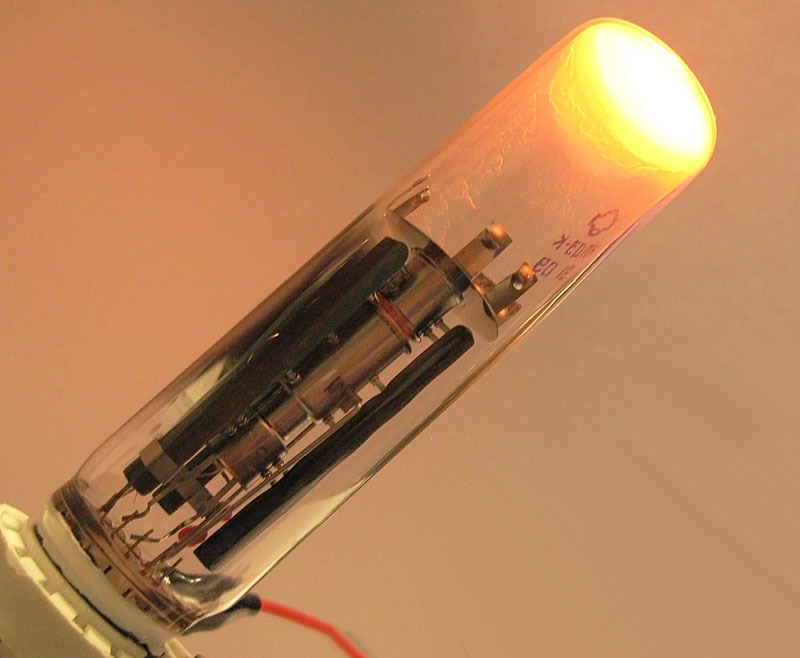 Each ILD3 display has a painted dot above the anode connection which indicates the tube's color. ILD3-S blue flood beam CRT, normal operation.